Every February while the chilly, damp winter weather still has its grip on the Carolina Coast, two doctors specializing in the dental field board a plane In Wilmington, North Carolina. After a five-hour trip, and a stop in Atlanta, they arrive at their destination. It’s an annual migration to retreat from the day to day pressures of work, and the unvarying everyday life, as most of us know it. 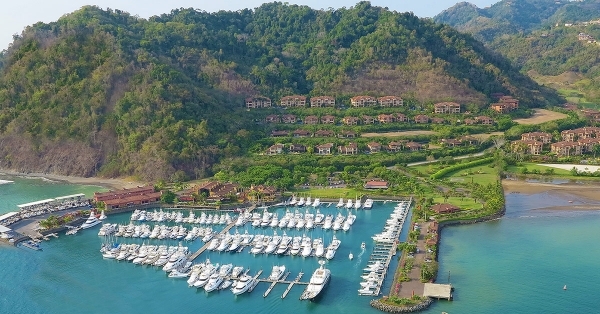 Their destination was the small town of Los Suenos on the Pacific Coast of Costa Rica. Dr. Steve Wallace and Dr. Scott Skinner of Wilmington, NC not only came to escape the cold weather but to find the great angling that this fishing Mecca is known for. It was a fishing trip on steroids that had become an annual tradition for the two. Landing in Costa Rica meant many changes from what they were used to. 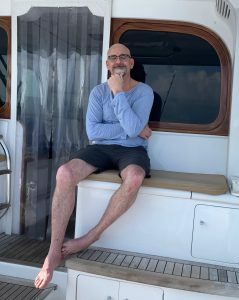 The weather was far warmer and the air conditioning on their charter was a relief, compared to previous boats they had chartered in the area, which lacked such a luxury. Another change from their everyday routine was shorts and t-shirts. The dress code for this trip, rather than their standard medical scrubs. With the temps hovering in the mid 80’s, both morning and night, the combination of air conditioning and casual attire came as a requirement for them rather than an option. 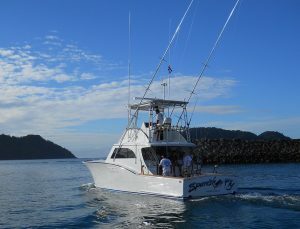 Each day at 7:30 am the 42’ Maverick sportfishing boat “Spanish Fly”, eased out of the Los Suenos Marina, with Capt. Daniel Espinoza in control from the flybridge. 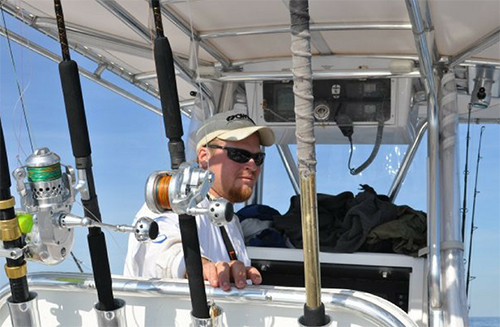 While heading out, the deckhand rigged up small Albacore for the coming day’s fishing adventure. Rigging as he had many times with nimble fingers and lightning speed with the finish products being well tied and skirted in a variety of colors. After a short trip out, Captain Espinoza pulled back on the throttles as a signal for the deckhand to start putting out lines. Within minutes all 7 lines were fully deployed, and the “Spanish Fly” was now trolling at a range of 5-8 knots. As the sun continued to climb, so did the heat. 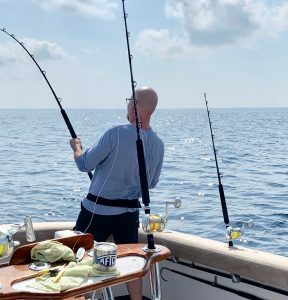 The doctors admired the beauty of the cobalt blue Pacific Ocean while hooking Pacific Sailfish, which are much larger than the sailfish found off the Carolina coast. 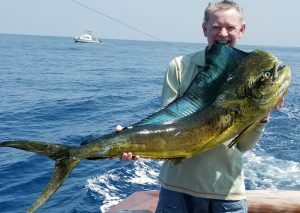 Their catch also consisted of some large Marlin and enormous Bull Mahi. In between hookups, when the two needed a break, they would retreat to the air-conditioned salon to cool off until the next strike. When the “Spanish Fly” would back down on their hookups, the water splashing over the transom cooled the anglers. It was a welcoming treat on a hot Costa Rican day. Lunch each day was prepared by the crew. It consisted of a traditional fare made up of rice, beans, and chicken. The remarkable part was that the food was heated on the boat’s engine prior to serving. A rather creative means of getting a hot meal out on the open water. Even after a scorching hot morning of fishing, it proved to be a tasty and innovative lunch break. One evening, they brought their catch of the day to a local restaurant named “Lemon Zest”, where it was prepared and served for the two Carolina fishermen. They couldn’t imagine a more fitting end to a great day on the water. This trip proved to be just as enjoyable as all their earlier visits to Los Suenos, even with the high expectations from their past visits. The fishing scorecard was quite impressive this time as well. 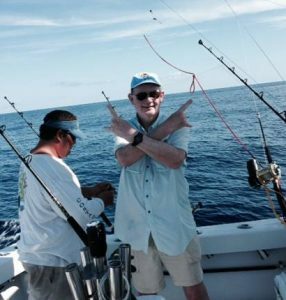 The total catch was 19 fish, made up of 14 sailfish, 2 Marlin and 3 Bull Mahi. Reflecting on the trip, it was an extraordinary time, complete with fantastic fishing and enjoying a beautiful area of the world. The food was especially exceptional, even with it being cooked on a boat engine. The best part of the trip though was two friends taking a few days to step out of the pressures of their everyday life and enjoy doing what they love…. Fishing. Of all the wonderful memories the trip leaves them with, it’s about the world of fishing with friends. The world we all love to live in.